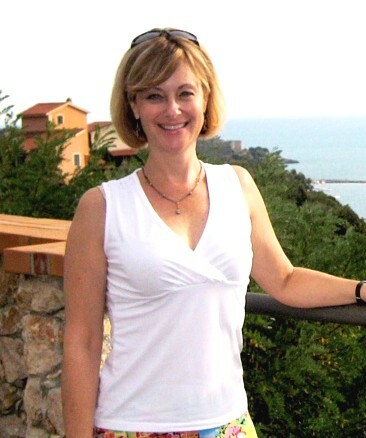 “Wanna be Italian” published by Sharon Sanders, food editor, writer and author, and blogger of Simple Italy. Melissa Muldoon is a freelance graphic designer living in the San Francisco Bay Area. Through her firm, Melissa Design, she creates graphics for Web and print. Raised in the Midwest, she studied studio art and history at Knox College. At the University of Illinois at Champaign, she worked as a teaching assistant and earned a Masters degree in Art History. Deciding she’d rather be “doing” art rather than “talking” about art, she pursued a career as a graphic designer. She is married to Patrick Muldoon and has three boys and a beagle. Her passion for art opened the door to Italy for her. During college she participated in a study abroad program in Florence and discovered a country full of history, culture and tradition, yet overflowing with contemporary style and quirky idiosyncrasies. 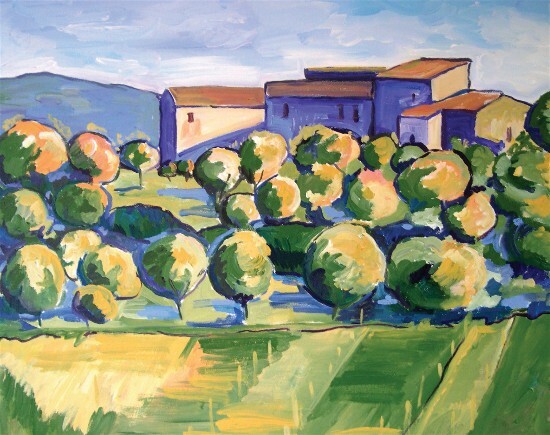 Her love for art brought her “home” to Italy for the first time. A: Ma dai! Non c’e’ un modo migliore! Come on! There is no better way to live! A: Let me just start off by saying I am a classic type A personality. I am impatient, competitive and a list maker. I don’t know what I like better, adding things to my “to do” list or checking them off. I’m usually up late finishing a project or starting the next. I zoom from one appointment to the next and despise sitting in traffic or wasting time at stoplights. Now, while a type A lifestyle is great for getting things accomplished and moving ahead in life, it may not be the sanest way to live. Fortunately for me, I found Italy and discovered how to “live Italian.” Italy is my alter ego. It balances out my yin and yang. When I am in Italy, time slows down and I relax. I let go and go with the flow. My senses are reawakened and my creative side is nurtured and flourishes. I savor meals and notice things like the multi-colored marzipan pastries elegantly displayed in the panetterie and bars, or the wheels of cheese stacked up like oversized building blocks in the corner markets. I feel the cobblestones, worn and rounded by time, under my feet. I hear the clang of the church bells and the ronzare of the Vespa bikes. I meet the most interesting people, Italian locals and fellow travelers, and develop long lasting friendships. Italy brings out the best in me and I try on a daily basis to remember and nurture my “inner Italian”. When I am most frenetic, I think of Italy, take a deep breath and recall the fields of Val d’Orcia or the rocky Ligurian coast, and this helps me to regain my calm sense of self. Perhaps I could never “marry” Italy, I am after all a type A personality and do love efficiency, but I LOVE my “love affair” with the country. It is a romance that I never want to end. It helps me remember what is truly essential in life; appreciating beauty, enjoying small pleasures and nurturing friendships. A: My Inner Italian was first awakened during the fall of 1981, when I studied Art History and painting in Firenze through Knox College’s study abroad program. It was my first solo trip abroad and I lived with an Italian family while attending art classes in via del Fiume, near the church of Santa Maria Novella. My home base was Florence, but I also had the opportunity to travel around Italy soaking up historical sites and master works of art in Rome, and Venice and other smaller towns. It was during this time that I first fell in love with Italy. Michelangelo, Giotto and Ghirlandaio took me by the hand and opened my eyes to a wealth of images, art and architecture that I continue to draw upon for inspiration. In Florence I took my first Italian language class. However, it was not a priority at that time. I frequently skipped language classes to sit in the bars and drink espresso with friends, or lounge on the steps of the Duomo enjoying la bella vita as I watched the busy, fashionable Florentines go about their daily business. My inner Italian lay dormant for several years after my return to the States. In fact, the first thing I did after I came home was to buttare via il dizionario throw out my Italian dictionary. But, funny how some experiences can haunt you and change your life forever! It wasn’t until years later, after beginning a family and starting a successful graphic design business that my “inner Italian”, which I call Girasole (Sunflower) was reawakened. In 1996 my mother gave me Frances Mayes’ book Under the Tuscan Sun for my birthday. I read that book cover to cover and it brought back a flood of memories, smells, tastes and sounds that resonated with me. The Italian words that Mayes sprinkled throughout her writing rolled around in my head and I regretted not having really learned the language. In those moments of vicariously traveling through Italy with Mayes, something profoundly shifted in me and like a golden Tuscan Girasoleturning toward the sun, my Inner Italian slowly started to come alive and blossom. That year my husband and I made our first return trip to Italy. I longed to show him “my” Italy. I came home from that trip and immediately went out to the local bookstore and stocked up on grammar books and tapes, thus beginning my passionate quest to learn the language. A: For me “living Italian” means recreating a little piece of Italy here at home. It means bonding with others who are passionate about Italy. It means enjoying the Italian culture through friends, films, TV, books, coffee, cooking and sharing meals. A day doesn’t go by that I am not thinking about expanding my Italian vocabulary or perfecting my Italian grammar. All my American friends are used to the fact that half the postings on my Facebook page are in Italian or have something to do with Italy. I can get as excited about a statue of the Madonna by Donatello, as I do for a Dylan Dogcomic book by Tiziano Sclavi. I like to listen to streaming Italian radio while I work, drink coffee made in my Moka caffettiera and eat Panettone served on my Italian ceramic ware during the holidays. For me there is nothing finer than humming along to Zucchero while attempting to make homemade gnocchi with fresh basil from the garden. And what Google search wouldn’t be complete without discovering an expat’s blog about living in il bel paese or skimming the on-line pages of Gente to check out the newest Dolce & Gabbana fashions and latest Italian gossip. I confess, I am an Italian soap opera junkie and my day isn’t complete unless I have downloaded the latest episode of Un Posto al Sole onto my iPod so I can watch it while working out at the gym. And books! I can’t get enough of Italian novels and I would just as soon read an American or English author in Italian, than in English. Figurati! A: My Inner Italian is nurtured by my love for the Italian language and daily contact with Italian friends. It started at first as “The Melissa Project” – me, an Italian grammar book and a few language tapes. As I grew more confident about my language skills, I took evening classes where I actually had to open my mouth and speak the language. Then I branched out into my local community seeking out Italians to hang and converse with. I combed the Internet looking for chat groups, like impariamo.com andLiveMocha.com, to find people to communicate with through message boards and Skype. I now have dear, close friends, who I never would have known, had it not been for my passionate love for Italy. Because they are there, thinking of me, part of me always lives in Italy and that thought nurtures my Inner Italian! A: My favorite Italian movie is Cinema Paradiso directed by Giuseppe Tornatore. This is a wonderful nostalgic film about childhood memories, first love, and changing times. The music is wonderful, the characters are lovely and the story is powerful. A: I lived in Florence during a study abroad program when I was in college. I also visited Siena, Lucca, Viareggio, Venice and Rome and many other places throughout Tuscany. Visiting Rossella in her home in Garda, we met through a chat group and became best friends. A: Since 1995, my husband and I have returned to Italy almost every two years. Our most recent trip was in September 2008. I specifically select locations further out from Rome and Milan where I can use my Italian and my husband can practice his Italian driving techniques. As friendships are born on the internet, so are vacation destination points. So, last fall I selected the cities of Mantova, Bardolino, Parma and Lerici. In Mantova we visited the in-laws of my dear friend Roberta, who have a summer home in the outskirts of the town. We spent a wonderful day with them in their home, where they cooked spectacular meals for us and with them we visited the medieval Ducal Palace of the Gonazagas, as well as the more modern Grana Padana cheese factory and the vineyards near Garda, where we witnessed the start of the vendemia (grape harvest). In Bardolino we spent a day with Rossella and her husband Massimo, who own a leather shop. Massimo is also an artist and we had the pleasure of visiting his gallery and seeing his paintings. In Parma we toured the city and lunched with our friends Gabrielle and Monica. We ended our sojourn in the little fishing village of Lerici on the Ligurian coast where we visited Megan and her husband Luigi. We cooked with Megan’s mother-in-law one day and swam in the Bay of Poets the next. Despite a little bit of rain (okay, maybe a lot of rain!) we thoroughly enjoyed our visit. I am currently at work planning our next visit in September 2010. View from our hotel room in Praiano. A: Definitely not an easy question to answer, as I have not yet explored all of Italy. Puglia, Sicilia, Sardinia and all points south of Amalfi are yet undiscovered. But if I were to pick a spot right now, it would have to be in the area around Pienza and Val d’Orcia. First of all, my husband and I love Brunello wines and I love the picturesque countryside. However, Ido love Gubbio in Umbria, the truffles and hills are amazing…and there is something ever so lovely about Liguria, il pesce (the fish) and the sea…so, I will have to make a few more visits to Italy before giving a definitive answer to this question. 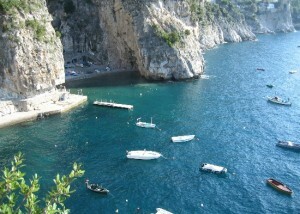 But, I do daydream quite often of having an Italian casa to return to during the summers! Magari! Someday! The Dalla Ricca Family prepared lunch and dinner for us. It was a never ending feast of great food and wine! A: Again a very tough question, seeing as every meal I have ever had in Italy, including those at the autogrills along the highway are superb according to any American standard! But, in the end I would have to say, for my last meal I would like Paglia e Fieno or Straw and Hay pasta that was made in a little trattoria just off Piazza Santa Croce in Firenze. I don’t recall the name but it was owned by the Italian husband of my American Art History teacher. I have yet to taste a finer bowl of pasta…or, maybe it would be the stuffed focaccia we had at La Bonta Nascoste during our last evening in Lerici. Again, I will have to get back to you on that…more field research is required! Italia il cuore resta con te. Ci ritornero’ il piu’ presto possibile! Italy my heart is with you, I will return as soon as I can! il tuo spazio web mi piace molto (sia nei contenuti che nella grafica) e penso possa essere utile a chi si sta avvicinando alla cultura e alla vita italiana. Anch’io ti aggiungerò -con molto piacere- fra i miei link. Sono molto lieto di aver scoperto oggi la Sua website via Michele Filippo. Ho letto fino adesso il Suo diario di una studentessa matta e devo confessare che anche io sono un po’ “uno studente matto”. Io abito in Moraga, quasi 45 minuti da Fremont, e se qualche volta ha dei incontri con altri “matti”, vorrei partecipare in una discusssione, ma certamente in italiano soltanto. Come e’ chiaro sono innamorato di tutte le cose italiane. Alla fine del giugno vado in Italia per una breve vacanza presso il Lago di Como, a Bellagio. Non sono stato mai nella regione dei laghi, conosco soltanto le grandi citta’ come Roma, Firenze, Venezia, Napoli, ecc. Io sono un ingegnere mecanico, ma le arti grafiche mi interessano molto. Cosi’ abbiamo due interessi communi, l’italiano prima di tutto. Spero di sentire da Lei e, forse un giorno, avro’ il piacere di fare la Sua conoscenza. Sei molto gentile di rispondermi cosi’ rapidamente e con tanta allegria. Si’, certamente possiamo darci del tu ed evitare le formalita’. Seguiro’ il tuo suggerimento di scoprire luoghi nuovi nelle piccole citta’ intorno del lago di Como, quando saro’ in Italia esattamente in tre mesi. In riguardo a un incontro per fare la conoscenza, credo che questo si potrebbe compiere facilmente e forse sarebbe possibile anche di radunare un piccolo gruppo di altri studenti “matti” per un caffe o un pranzo a un ristorante italiano nella tua zona, principalmente pero’ per parlare e sentire la lingua di Dante. Pero’ non so come trovare questo gruppo di altri “studenti matti”. Io conosco qui’ un gruppo di studenti che studiano l’italiano, ma non sono abbastanza facili di parola italiana. Mia moglie capisce italiano ma non lo parla. Se non troviamo altri che parlano italiano, forse possiamo aver un incontro soltanto con i nostri sposi. Se l’incontro con un gruppo si realizza e va bene, forse lo potremo organizzare una volta ogni mese oppure ogni due mesi. Io posso venire facilmente a Fremont per godere la compania di altri che amano la lingua e la cultura italiana. Questo e’ il mio sogno. Altrimenti, devo dirti che non c’e’ una goccia di sangue italiano nelle mie vene, ma’ mio cuore e’ tutto italiano. Melissa, I know how you feel. I also dream of Italy, and I haven’t been there yet. My grandparents are from Benevento, outside of Naples. I am constantly dreaming and reading about being there, presto! Ciao Laura, è bello sognare d’Italia! Un giorno spero che tu possa andare a Benevento, dove sono venuti i nonni. Spero anche che tu venga a trovarmi di nuovo! A presto! Che bella scoperta il Suo sito! Anch’io sono innamorata della bella Italia. Infatti ho scoperto il Suo sito via Dianne Hales (Ho letto Becoming Italian). Sono nata in Italia ma avevo cinque anni quando i miei genitori sono immigrati in America. In casa si parlava solamente dialetto che è molto diverso dalla lingua italiana. Per dire la verità, il dialetto barese è veramente una lingua straniera. Comunque sto cercando di imparare la vera lingua di Dante. Sono contentissima d’aver scoperto questo website per praticare il mio italiano che abbia bisogno di miglioramento. Infatti sono imbarrazzata perché essendo italiana dovrebbero parlare e scrivere meglio. Comunque dopo aver letto Becoming Italian di Dianne Hales ho deciso di dedicarmi di nuovo all’apprendimento della lingua e cultura italiana. Le ringrazio molto per aver creato questo sito e le auguro buona fortuna. Grazie mille per i complimenti ma veramente non li merito. Mi dispiace ma ho fatto uno sbaglio gravissimo che vorrei correggere – il libro di Dianne Hales è intitolato La Bella Lingua, il suo website è Becomingitalian.com. Di nuovo grazie e tante belle cose! I enjoy reading your pieces and trying to make as much sense of it as I can and looking up the odd word or two. I’m learning Italian and it helps a lot. I’m visiting the Bologna Childrens’ Book Fair at the end of March and brushing up my ‘get by in Italian’. I’m looking forward not only to seeing what goes on at the Fair and trying to find a publisher and animator/TV-dvd rights for the book but also to exploring another Italian city. So far I have spent a month on holiday in Italy staying at Lake Garda and Firenze and visiting nearby towns and cities (Pisa, Verona, Vinci, Venezia, and was thrilled to see Galileon’s telescope in a small museum in Padova). As a vegetarian Italy is a favourite holiday destination for me as I have more choice of food here than anywhere and I love seeing original art of the masters still in the churches. Thanks again for sharing your love of the language and the country and culture. Ciao Melissa- I am sure I saw where to order books in Italian from on your blog but I haven’t been able to find it. Can you give me that information please. Ciao mi chiamo Paola e sono italiana. Trovo il tuo sito delizioso e in tempi critici come il nostro, dove gli italiani odiano sempre di più il loro paese, per i politici che lo stanno governando malissimo, facendolo ritornare indietro di 60 anni. Perchè l’Italia non è abitata da gente ignorante con il mandolino in mano e il piatto di pasta e tutti gli uomini tastano il sedere delle donne come fanno vedere alla CNN o BBC, e francamente ne sonoi indignata! C’e’ una Italia che lavora, che vuole migliorare, che adora mangiare, amare, ospitare gli stranieri, lavorare sodo, sperare nella rinascita del nostro paese. Mostrare al mondo la bellezza della sua cultura, la tolleranza verso i popoli e le tante opportunità che un paese come il nostro può offreire, ma che purtroppo per turpi calcoli economici di faccendieri politici non e’ possibile .Trovare per caso una donna americana che si sforza di capire, scrivere nella mia lingia. Che ama il nostro paese a tal punto da divulgare la sua lingua e le tradizioni, e beh, lasciamelo dire: E’ pazzesco e mi onora. Sono orgogliosa di essere italiana e sono contenta che tanti americani si sforzano di conoscerci e di non vivere di un semplice stereotipo: italiano = mafia! Semmai, dirò al nostro Presidente della Repubblica di onorarti con un encomio. Grazie per portare nel mondo la nostra cultura e renderla bella!